Last night I watched President Obama’s speech after the United States sent a SEAL team to go “get” Osama bin Laden. We got him! Excellent news, any way you slice it. After nearly a decade, we finally got our man — the head is cut off Al Qaeda. Another head will soon grow (the war on terrorism isn’t over, after all), but this is good news. Justice has been served, as the president said last night. Officials said that bin Laden’s body was treated in accordance with Islamic tradition before being buried at sea. This, of course, will prevent Islamic extremists from using it as a shrine or rally point. Something bothered me about last night, though. Wanting bin Laden was about justice, not vengeance. But video and photos of Americans celebrating was all over the news last night and today. A man is dead, and Americans are celebrating in the streets with chants of U-S-A, U-S-A. Isn’t that just a bit unseemly? Is that really the image of Americans and the United States that we want the world forming its opinions of us on? A man died. Yes, he was a heinous, monstrous man who deserved the bullets he got, but he was a man. 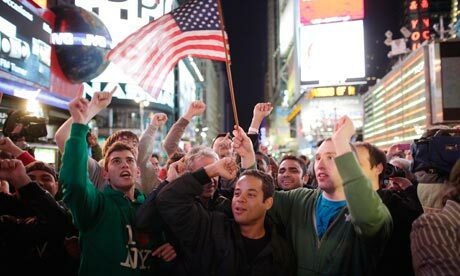 The sight of so many Americans celebrating, waving flags, and chanting had to further enrage bin Laden’s followers. Did the celebrations create more bin Ladens? No one’s saying that we shouldn’t be happy that justice was done. I’m very happy. But I don’t think people should be out there celebrating like we just won the Super Bowl. Aren’t we supposed to be better than that?